Though I have not been on campus at Lesley University for over a year, I know that there has been a lot of change. Well, it is a new year, and this trend will continue. One area to measure the changes for life at LU is the change of guard for university Presidents. For the third year in a row, a new person will be at the helm of our proverbial ship. However, President Richard Hansen is no stranger to academia, nor is he a stranger to Lesley. The story of President Hansen represents a progression of experience in the academic world. As a young man, President Hansen grew up in Colorado, enjoying a peaceful life in the mountain west. He first dipped his toes into this career serving as an RA assistant his senior year. After graduation, Dr. Hansen took his first full time job at UVM serving as the head of student activities. It was here that he saw the value of student life experience. After that he moved up the ladder, each rung teaching him something new about what a university could offer to anyone seeking to learn. In particular he gained considerable experience in adult learning, a key part of the Lesley experience. Q. What drew you to Lesley? A. I have followed Lesley for many years as an institution that is known for progressive education and always placing the learner first. Also, Lesley is known for always providing access for adult students. When I was finishing my two years as provost at Wentworth Institute of Technology here in Boston, I jumped at the opportunity to take the position as interim provost and help President Weiss determine what skills and background the institution needed in a permanent provost. On top of valuing the work Lesley does, we live in Somerville and I can walk to work. Q. What is the focus this year? A. We are focusing on student success and helping students finish on time, understanding how we can make Lesley more attractive to adult and transfer students and implementing new academic programs, such as the Bachelor of Social Work and the new 4 + 1 MBA program. A. Being with our new granddaughter who lives in Cambridge, walking in the woods, and being at our family camp in Vermont, and reading. Q. How has your time as interim provost given you perspective while taking on this new role? A. I think the major perspective has been an overview of our academic programs and their strengths and weaknesses, including opportunities for growth. I have also learned that our faculty are dedicated to the success of our students and are always looking for ways to be innovative in the classroom or studio. Q. We’ve seen the growing culture and impact of athletics on the University, as well as a desire for athletic facilities. What does that continued growth look like from the perspective of the administration? A. Intercollegiate athletics at the Division III level provide tremendous leadership opportunities for our students. Student that participate in our athletic programs bring solid experiences back to the classroom and their student life experience at Lesley. Our student athletes and coaches have the additional responsibility of scheduling practices and games at facilities away from our main campus. I am open to continued discussion on how we solve our facility issues both on and off campus. Athletics are a great learning experience for our students and I am supportive of our effort to make this experience even stronger. 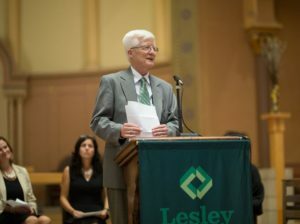 Interim President Hansen speaking at the recent Lesley convocation. Photo courtesy of Mark Teiwes.